Last night (New Year's Eve Eve) found me enjoying a glass of wine with my friend Adam. Adam knows that I am a member of this wine blog, and tonight I tried to do something a little different. 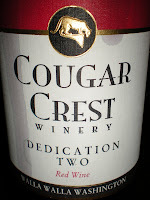 While at Adam’s this evening, I pulled out a bottle of Dedication Two from Cougar Crest Winery. Cougar Crest is a winery in the Walla Walla region of southeastern Washington. This bottle was from the trip some of us from the Oregon Wine Blog took to the region over the summer. This is a very special wine in many ways. The daughter of the winemakers was in an accident and was taken to Doernbecher’s Children Hospital in Portland, Oregon. The doctors were successful in healing the daughter of the winemakers and as a result, a portion of the proceeds from this wine goes to Dorenbecher’s at Oregon Health and Science University. The reason this is called Dedication Two is because this the second release of this wine. The website describes this red table wine as a “complex blend of classic Bordeaux varietals, plus Lemberger, and Syrah.” It is also noted that the Dedication Two has a little bit of an “extra Syrah,” and is aged longer in the barrel. Tonight while Adam and I drank the Dedication Two, I decided to ask him what some of his thoughts were of this wine and make note of them to see where they might be different from my perceptions, so the evaluation of this wine will be different from others I have done. I helped Adam with notice the way the blend coats the glass. I paid attention to the legs are somewhat absent. It should be noted that despite how it might appear, we did both enjoy this wine - the full flavor of it and rich nose - tipping our hats to the winemakers.